All the B's for breakfast here. You want a hit of nutrition in the morning? Well this is going to slap you right in the face with it. 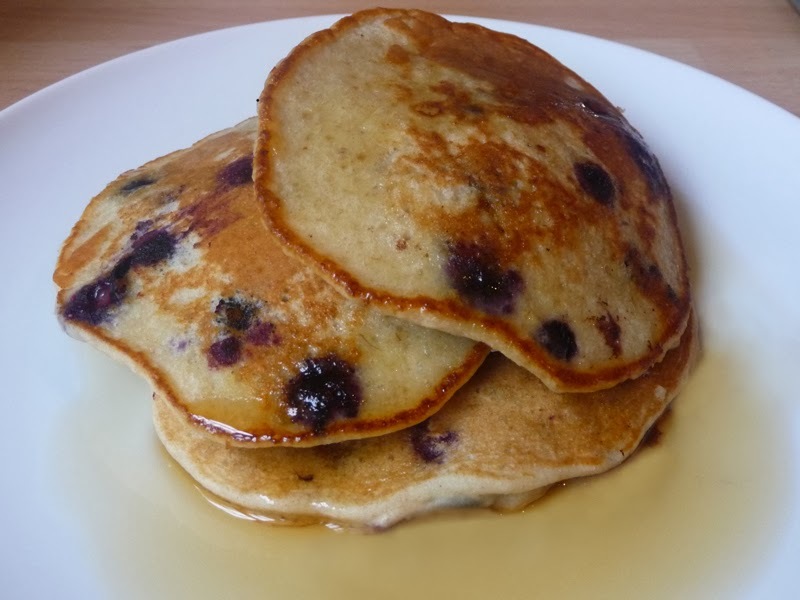 American style pancakes are a common feature on Saturdays in this household. Baby Foodie just loves them (and I love seeing his happy blueberry smeared face). They go down well with us adults too. We worship wheat in this house and have it pretty much for every meal, so it's nice to have a break with buckwheat, which isn't wheat at all, more of a seed-like grain. Proper good for you too. In a large bowl beat the mashed banana, egg and yogurt together. Add the milk and mix again. Add the flour, oatmeal and baking powder and combine thoroughly, getting some air into the mixture so surface bubbles form. You want a thick batter but should pour easily. Finally stir in the blueberries. The mixture is best left for 5-10 minutes, which will give a much lighter pancake. Add a small knob of butter to a frying pan and melt over a high heat. Once hot, spoon in ladels of batter (I can fit 3 pancakes on a large frying pan). Wait until small holes appear on the batter surface, then turn. Cook in batches of three.